The weight loss program that started it all. That’s what you will be saying in a month from now. The time to start losing weight is today! It has finally arrived! No more procrastination. No more excuses. It’s time to jump up and get moving! This weight loss program is like no other. Every day, for 30 days, you will wake up to an email with a link to your daily dose of weight loss motivation, workout tip and a healthy recipe or nutritional tip. 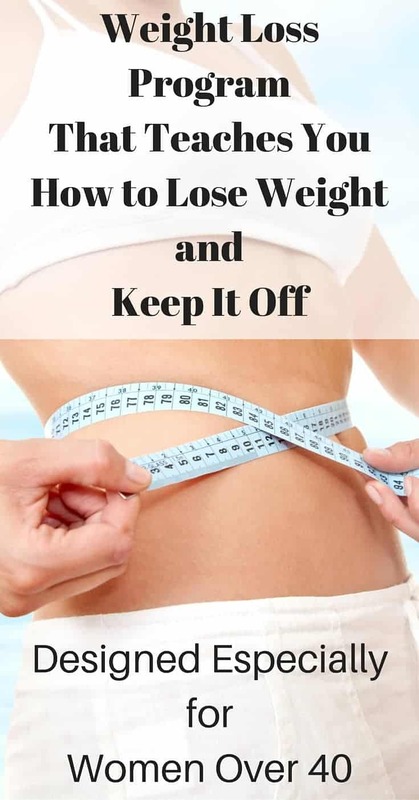 Many of you have expressed the obstacle of getting into a regular workout routine as well as eating healthy foods is to your weight loss program. This weight loss program is designed for you! More and more women over 40 are jumping on the weight loss and exercise train for the first time in their life. When I started working out, it was all very new to me also. 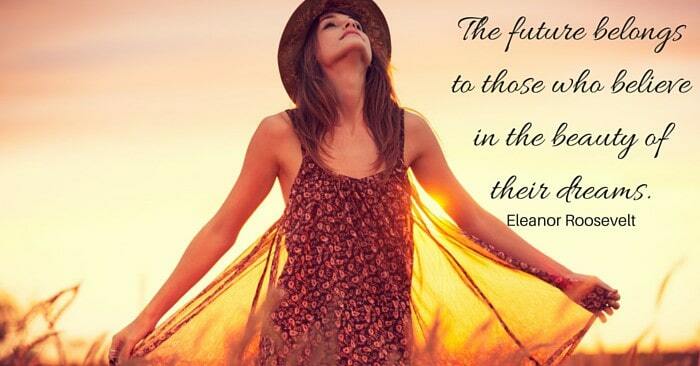 The future is a healthier, younger feeling you! The future is achieving the WHY you discovered (click here if you haven’t discovered your VERY important WHY, crucial to success) when you made the commitment to evolve into a healthier you. Losing weight means making some changes to your lifestyle. Gradual changes and commitments because remember, not even Rome was built in a day. Start with the easier changes that will snowball into more motivation to work on the more difficult changes. Today is the first day of your future. Your body will become what you make of it today. Start, right now, believing you can achieve your goal. Take the first step today to make it happen. What workout are you going to do? Start strong by knowing you are going to push yourself as hard as you can. Take a short breather break if necessary, and then jump right back in when you can. Don’t hesitate to use the modified version of an exercise if you need to keep pushing through. Every day you workout, you will get stronger and can push a little harder until one day you don’t need to modify due to exhaustion. Follow your workout with healthy nutrition throughout the day. You’ve worked hard. Now don’t undo that hard work by not eating well. What healthy nutrition are you following? 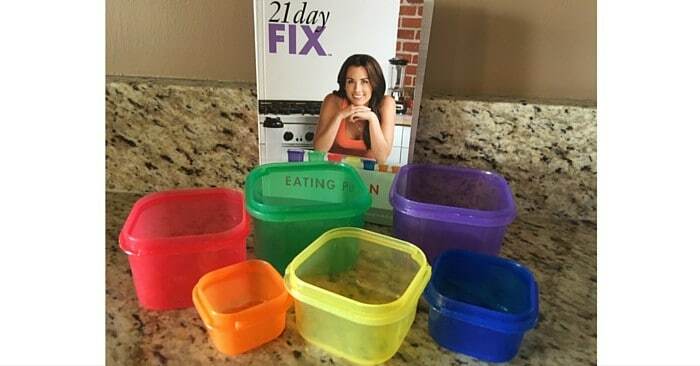 Have you tried the 21 Day Fix Plan? Don’t let the containers scare you. Every time I have been on it, I have a hard time eating everything for the day. It is a BeachBody program. You probably already realize I am a huge Beachbody believer and have been doing their workouts for years. The 21 Day Fix is a workout and nutrition program. If you don’t want to do the workout portion, you can purchase the containers alone from Amazon. The containers are one of the best inventions yet for nutritional guidance. The containers look tiny, but a whole lotta food can fit in them! Follow me on Instagram, I often post pictures of my food. You will see my plates are full when I am using this program! What I love about eating healthy means usually less time spent in the kitchen cooking. Eating healthy for me means no long recipes of casseroles or time consuming recipes. It’s usually about steaming a vegetable or two, adding a salad and a grilled meat of some type. Easy peasy. Here’s a quick shot of what I made a few days ago. 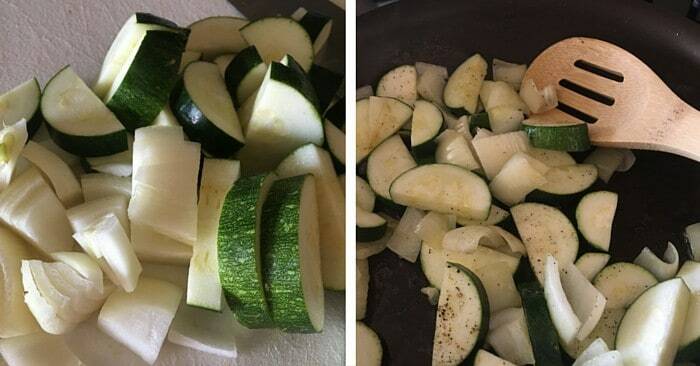 Simply chopped a zucchini and a small onion. Threw them in a frying pan with a dap of olive oil, a little pepper on medium high heat for 2-3 minutes. 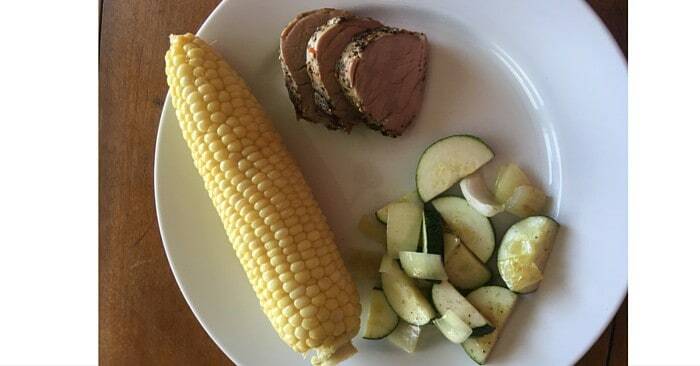 The meat was a pre-seasoned pork tenderloin that I threw in the crock pot earlier that day. Added a lightly boiled fresh ear of corn. Healthy dinner in about 20 minutes total time in the kitchen! There are so many easy, simple meals you can make when you eat fresh, healthy food! I am all about easy, simple and fast! Prepare for tomorrow’s surprise treat by cutting a medium banana in 4 pieces and freeze. Trust me, you will be so glad you did! Now, go get moving and start your day off with some endorphins! Don’t forget to snap me or tag me in one of your social media posts after your workout!